The Back Yard Obstacle Course is by far is the ultimate Inflatable bouncer choice for your party, outdoor event, or competition. It Features a series of challenging physical obstacles an individual must navigate though. You can be time to see how fast you can plow through, or kids can just be kids and play all over the course! Our Back Yard Obstacle Course includes running, climbing, jumping, crawling and sliding. Don't be fooled this obstacle course is a lot bigger than what it seems in the image. There are many ways to start your obstacle course. 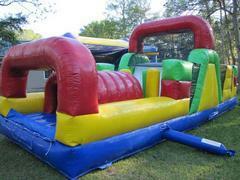 Whether you call them a bouncer, moon bounce, bouncy jumper, or inflatable - we have what you need!